If you are a halfway decent soul, chances are you are a sucker for the underdog. Sharat Katariya’s Sui Dhaaga (Needle and Thread) - Made in India is designed to touch that chord in us humans that makes sports fans sometimes cheer for a dark horse even when she is on a rival team or from another nation. 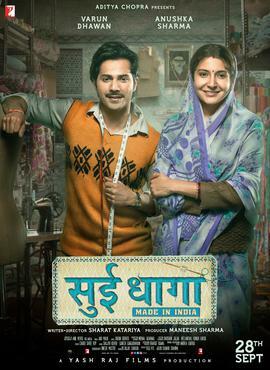 This is the story of Mamta (Anushka Sharma) and Mauji (Varun Dhawan), a young wife and husband belonging to a community of artisans who have over a couple of generations gradually turned their backs on their inherited trade – tailoring, embroidery, block printing and other work involving garments and fabric – since the income from these is barely sufficient for their sustenance. Like Ved in Imtiaz Ali’s Tamasha (2015), though in a contrasting class setting, Mauji is pushed by his father to turn his back on a profession that his heart is set on. Here however, unlike in Ved’s case, the parent’s goal for his child is not wealth but survival even if it means being treated like a chattel by his employer. Mamta, though, wants more than just money for herself and her husband. She wants self-respect. She also believes that his tailoring skills could translate into a comfortable life for them, if only he would believe in himself. The film then is about the pair’s joint struggles to become self-sufficient by turning his talent into a profitable venture in the big city and to bring a smile to his well-intentioned but cynical father’s face. This is director Sharat Katariya’s third film, his first being the well-meant but forgettable 10 ML Love and the second the just-as-unforgettable Dum Laga Ke Haisha, one of 2015’s best from Bollywood. It is hard to miss the thematic sisterhood between Dum Laga Ke Haisha and Sui Dhaaga which is perhaps a reflection of Katariya’s worldview, his desire/willingness to see marriage as a relationship of equals, and his ability to write a strong woman without dipping into Bollywood’s lately developed clichéd interpretation of feminine strength seen most recently in Anurag Kashyap’s Manmarziyaan. Unlike these stereotypical women, Mamta never shouts and does not abuse – imagine that, Bollywood, this kind of strong woman exists! In fact in some senses she is painfully conventional, seeing the kitchen as her wifely duty and earning money as his. Yet she is unconventional as hell in the way she inspires and encourages him to dream for himself, and even more so when, as life saunters along, she starts dreaming dreams for herself too. Sui Dhaaga’s Mauji is very different from Dum Laga Ke Haisha’s Prem. Mauji is not dispirited and broken, he is an eternal optimist whose constant refrain even through trying times is “sab badhiya hai” (all is well). If he allows himself to be treated poorly by his boss at first it is because he is misguided into considering that the practical choice to make, not because he lacks a sense of self-worth. Crucially, unlike Prem, Mauji treats his wife with respect right from the start although it takes a while for their relationship to transition from a formal footing to fondness and finally love. Anushka Sharma gets a rare chance to display her versatility in this film (and to act with a hero who is not old enough to be her Daddy). Her Mamta is a calm, almost sedate woman, a far cry from the bubbly and/or overtly fiery characters that have dominated her career so far. She has been good in all those films, but it is nice to see a director investing his confidence in her with this vastly different role. She returns the favour with compound interest and a heartwarming performance. Varun Dhawan is sweet as Mauji. The comic timing that has been his calling card since his debut is well-tapped by Katariya here too, but in a more underplayed fashion than in his blockbuster comedies. Although he does not manage to subordinate his own personality to this role in quite the way he did in Shoojit Sircar’s October earlier this year, Dhawan is still consistently engaging as Mauji. The supporting cast are all unequivocally excellent. Katariya’s screenplay is packed with gentle comedy and warmth and many unspoken words. The most telling moment in the film comes in a scene in which Mamta is rushing along behind Mauji, Anil Mehta’s camera staying focused on their feet while she quickly catches up with him and they walk together, side by side. It reminded me of a beloved scene in a beloved film from long ago – the confidence in Arati’s stride in the closing scene of Satyajit Ray’s Mahanagar. Mehta is back at their feet in another scene when he, physically constrained, needs her assistance with the sewing machine. The camerawork in Sui Dhaaga is an important contributor to the endearing chemistry between the two characters and the statement about their teamwork that Katariya seeks to make. If the writing wavers, it is towards the end when the people of Mamta and Mauji’s world are parachuted into a high-society urban crowd. (Possible spoiler alert) Here and here alone, Katariya’s tone falters, and he seems unsure about how to portray the culture shock that basti dwellers would inevitably experience on their first visit to a Page 3 party or the green room at a fashion show. The effort not to be patronising to the ‘little people’ is clearly a strain, and shows up for instance in the possibly unwitting cutesification of a bunch of country bumpkins peeping through a barrier to watch models in various stages of undress. Besides, would an old, traditional Indian couple suddenly feel comfortable enough to hold hands in public on a stage merely because of the change in environment? And would a woman who is habituated to traditional Indian attire complete with pallu-covered head 24x7 suddenly design a Westernised gown with a dipping neckline for herself? I doubt it. The final half hour or so of Sui Dhaaga is a departure from the realism of the rest of the film and enters a fantasy realm that commercial Bollywood tends to prefer. it also fails to convincingly capture Mauji and Mamta’s rather dramatic overnight evolution from gifted artisans to sophisticated designers. This portion is what gives the film an uneven feel, but the trip till then is so rewarding, so amusing, so steeped in tenderness, affection for the characters and positivity that it makes the ride with Mamta, Mauji and their charmingly eccentric family and friends completely worth it. PS: Sui Dhaaga was shown with English subtitles in the Delhi hall where I watched it. This is uncommon for a Hindi film yet an important step towards bringing our cinema to the hearing impaired.